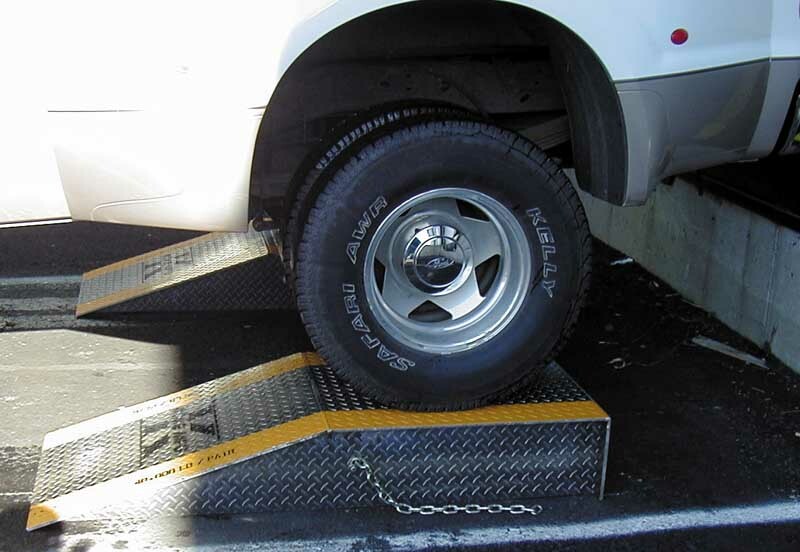 Wheel risers provide a way to raise trucks up to dock height. All trailers should be even with the dock or above the dock. Wheel risers provide a ramp for the truck to back up on. Top deck of ramp is a level off for rear wheels to rest on. Wheel risers are designed to accommodate over the road trailers, as well as single axle trucks. Available in 6”, 8” 10” and 12” heights, these steel wheel risers will provide a safe loading dock environment. Standard width is 24” for tandem wheels. 30” top length is for single axle trucks, and 84” top length is designed for tractor-trailers. Each riser comes standard with either lifting chains, Fork Pockets or mounting tabs for moving or permanently affixing to ground. Wheel risers will bring trucks up to proper dock height for loading or unloading. Mounting tabs or lifting chains are standard. Please specify which when ordering.